Is yet an adverb or conjunction? Yet can be used as an adverb and coordinating conjunction. We use yet as an adverb in questions and negatives to talk about something that has not happened up to the present time. In British English Yet is usually used with the present perfect tense. Yet is often placed at the end of the sentence. But we can use yet after 'have not', 'do not' or 'is/are not'. (British English) She hasn't sent the package yet. (American English) She didn't send the package yet. He hasn't arrived home yet. He hasn't finished his work yet. They haven't yet discussed the problem. Already is used to show that something has happened before a particular time. Still is used to talk about a situation that continues to exist. She is still cleaning the house. We use yet as a conjunction to connect two words, phrases or clauses. Yet means 'but' or 'nevertheles'. 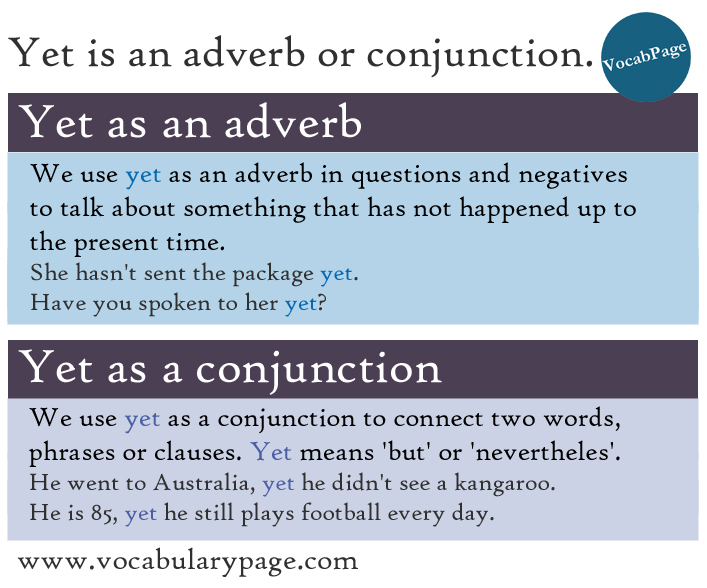 When but and yet are conjunctions, they can be used interchangeably. He went to Australia, yet [=but] he didn't see a kangaroo. He is 85, yet he still plays football every day. We sometimes use and with yet. I had a splitting headache, and yet I went to the concert.